Bethesda and id Software’s 2016 Doom reboot is a trip back in time to an era where gameplay was fast and furious, maps were complex, kills were gory and brutal, and the only story you needed was “There’s demons, go kill them.” More often than not, old-school reboots try to turn beloved old concepts into something modern, changing their very core and forgetting why people liked them in the first place. This new Doom, on the other hand, relishes in its old school game design core and never loses sight of what it wants to be. Doom 2016 looks like a current-gen game, but it plays like it is straight out of 1993 and that is a very, very good thing that no Xbox One shooter fan should miss. Doom 2016 (just Doom, from here on) features the return of the original green-armored Doom Guy who was recovered from Hell after the events of previous games trapped him there. He wakes up on Mars to find the demons of Hell invading once again, so he puts on his armor, finds a weapon, and gets to killing. Honestly, though, the story isn’t actually all that important here and the Doom Guy himself repeatedly smashes monitors and cuts off communication during cutscenes because he doesn’t really care what’s going on, so neither should you. There are demons to kill, go do it. That’s the story. The campaign in Doom is old school through and through with straightforward shooting and some of the best map design of any first-person-shooter in the last 10+ years. The levels have multiple paths to follow, require you to find key cards to advance just like the old days, and are absolutely packed with secrets. On our first run through of the game, which took roughly 8-hours, we only found something like 15% of the total secrets. Doom’s level design is particularly impressive because, despite winding around and offering lots of paths, we never really got lost. The game is very clever about using lighting to draw your attention to the critical path, or using the tried-and-true “enemies are here, that means I’m going the right way” philosophy, so you always know where to go. Granted, you miss a lot of secrets if you follow the critical path too closely, but you’re never just lost which was a problem with the older Doom games. The gameplay here is some of the most satisfying around largely because they kept it simple. You fire your heavy machine gun, or super shotgun, or plasma rifle, or a number of other weapons and the enemies get blown away in a cloud of chunks and goo. All of the classic Doom enemies like Imps, Pinky, Cacodemons, specters, Hell Knights, and more are all present, and the new designs are great. Gameplay-wise, of course, more powerful enemies require a lot more shots to go down, so you have to circle-strafe and use level geometry for defense in order to take them out. It is all just so deliciously old school. There are even honest to goodness boss fights here, and the final boss of the game is the most perfect classic boss we’ve fought in forever (they’re cheap and difficult but cool as heck). For more old-school-style Xbox One games, try Shovel Knight, Shadow Complex, and Ori and the Blind Forest. Doom does add a few modern twists to the mix, but they don’t really get in the way. Weapons have alternate fire options and are upgradeable, and these upgrades are mostly hidden away as secrets in the levels. Your armor is also upgradeable by finding upgrade points you take from other fallen soldiers to give you more health and ammo. A modern touch we really like is that most of the weapons, once you find them, are available on a weapon wheel you access by holding the right bumper. Certain weapons, like the chainsaw and the BFG ultra weapon, are accessible immediately via the X and Y buttons respectively. These weapons have very specific uses, and having quick access to them is awesome. We also love the glory kill system where you can stagger enemies and then run up and finish them off with a brutal execution move. These glory kills don’t just look cool, either, they also refill your health and ammo when you do them, so they’re a vital part of the gameplay. Our only complaint with the campaign is that it really loses steam by the end. Over the course of the game you go back and forth between exploring scientific facilities Mars and running around Hell, but by the end, the game just becomes a string of battle arenas where you fight waves of enemies. You enter a room, the doors lock, and then you spend the next 10-minutes fighting wave after wave of enemies as they spawn in around the room. The enemies always spawn in the same order, too, so you fight and fight and fight until you reach the big bads at the end, at which point the path forward opens up. As enjoyable as the combat genuinely is, the repetitive battle arena rooms really get old by the end. A great feature in Doom is that you can go back and re-play previous missions at will and all of your weapons and upgrades carry over. This way you can start over from the first level with endgame weapons, for example, which is awesome. Like we said, there are lots of hidden secrets and upgrades available, so going back and re-playing earlier missions is pretty enjoyable. The campaign takes about 8-10 hours your first time through without too much exploration, and going back and finding all of the secrets will add several hours to that total. When you’re done with the campaign, you can jump into Doom’s SnapMap editor and create your own levels. SnapMap is a little different from most map editors because it simply lets you use large pre-made rooms, rather than making everything from scratch. You can then add in enemies, items, weapons, exploding barrels, and much more to create your own campaign levels. While the campaign itself is only single-player, SnapMap levels can be played co-op with up to 4 people. SnapMap is easy to use and can produce really impressive results with relatively little effort. You can share your maps and download other players’ as well, so there will always be a ton of content available. You can also make multiplayer deathmatch maps via SnapMap, but the competitive multiplayer is one of the few missteps in this new Doom. For whatever reason, despite the fact the campaign is so fast and frantic and fun, multiplayer is really sluggish and slow and kind of boring. It is too boring to be considered old-school like the campaign and is too simple to appeal to modern online shooter fans. The multiplayer here is totally forgettable. Good thing the rest of the package more than makes up for it. Visually, Doom is a good-looking game overall. The red/brown/gray color palate (it is Mars and Hell, after all) fails to really inspire, but the indoor areas are surprisingly detailed and the enemy designs are absolutely fantastic. Glory Kills are rewarded with ultra close-up views of your character ripping and tearing through demons, and they look totally awesome. It is also worth noting that, unlike Doom 3, this new Doom is not full of dark areas and annoying flashlight management. In fact, there is no flashlight mechanic at all here. Apparently, the demons paid the light bill this time around. Something else that has to be addressed, however, is that the performance of the game is really uneven. The framerate drops frequently from the promised 60FPS, but we also had the game frequently stop entirely for a few seconds at a time (loading, perhaps?) before going again. The sound is also a little uneven. The soundtrack is made up of heavy industrial metal music, which is about as perfect as you can get for slaying the demons of Hell with brutal ultra-violence. Sound effects for enemies and the environment (pay close attention to the old school Doom door sound effect for when secret rooms open up) are great as well. The weapon sound effects are a little disappointing, however, as they are very muted and not nearly as loud and bombastic as they should be. Doom 2016 is pretty much the antithesis of everything first-person-shooters have become over the last 20-years. It isn’t full of immersion breaking cutscenes, bland combat, or straight-line level design. It is fast paced, bloody, violent, full of secrets, has great map design, great enemies, and a truly amazing soundtrack. Just like Shadow Warrior and Wolfenstein: The New Order, Doom is old-school and classic game design brought forward to today, and it is awesome. If you loved old Doom games, you’ll love this new Doom. If you’re just tired of the same old FPS campaigns over and over again, you’ll love Doom. 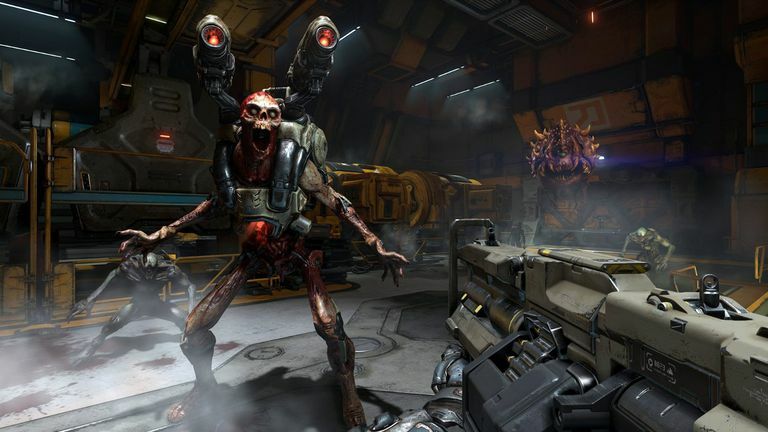 If you just want to play the most metal game ever made, you’ll love Doom. We highly recommend it.